The Land aka Amber Fox: Happy Victoria Day! Happy Victoria Day to all you good Faeries at Amber Fox and throughout her Majesty's realm. 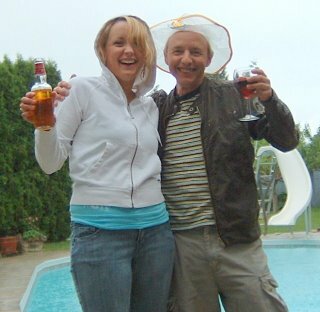 I took a day out of the undercover stuff, popped my rain hat on and enjoyed the warm rain, using Shy-Anne's pool with a few friends, here a couple of us toast our most Gracious Queen. Happy Birthday to "Elizabeth the Second, by the Grace of God, of the United Kingdom, Canada and Her other Realms and Territories Queen, Head of the Commonwealth, Defender of the Faith." Now Betty wasn't born on the fourth Monday of May, it was April 21, 1926. But then all you good Faeries knew that. And guess what, her real name is Elizabeth Alexandra Mary Windsor and she belongs to Britain's Royal House (Family) of Windsor (not Windsor Ontario though). The picture above was taken on April 17, 1982. 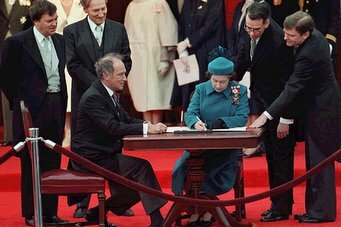 The Queen is signing the Canadian Constitution and Charter of Rights and Freedoms. Canada's best known Faerie, Prime Minister Pierre Elliott Trudeau watchs. Many countries use the tune for their national anthem and it was according to Wikipedia, the "defacto" national anthem of the United States through out the 19th century. The song is "My Country, 'Tis of Thee." You can find the words here. Ricky, you look totally adorable in that hat! I just had to say that. It's great in the rain. It even has a ducky on the front! A perfect Boy Faerie hat!